Billed as ‘the most comprehensive and authoritative knowledge event in healthcare IT today’, the HIMSS12 Annual Conference commenced this week. Borrowing from the success of the TED conferences, the event was kicked-off by Twitter cofounder and innovator, Biz Stone. Careful to point out that his purpose was not to deliver healthcare social media strategy, he instead left the audience with the notion that the health care industry could expand its reach by embracing entrepreneurial humanitarianism. In keeping with this sentiment, Intel’s Global Director of Innovation, Eric Dishman and Innosight Institute’s Executive Director, Jason Hwang MD, noted that healthcare IT is the conduit for improved access, heightened collaboration and faster decision-making. And while technology can bring physicians, patients, payers and other necessary healthcare organizations together, IT alone will not lead to better patient care. Last but not least, in a MedCity News interview from the conference, Lisa Suennen of the Psilos Group, reiterated the need for healthcare start-ups to, “(not only) find technologies that engage the consumer, provider and payer altogether in a system in order to make a difference, (but also) be able to demonstrate concrete measures of cost savings and return on investment.” Most telling, she also mentions, “there is a lot of (technology) to collect and preview data…but not much in terms of taking it from a pragmatic standpoint to make an operational difference”. Aha, score one for process improvement AND technological advancement. Based on Information Week’s Marianne Kolbasuk McGee HIMSS12 preview, it will be intriguing to determine which of the following newest health IT ideas will successfully reduce cost, improve quality and facilitate patient engagement. Here are my favorites. With many more available for review at the conference, what were yours? MyHospital24/7 Telemedicine Platform – MyHospital24/7, from Consult A Doctor, is a turn-key suite of telemedicine services configurable for hospitals and health systems. The telemedicine platform, which will debut at HIMSS, allows hospitals to offer their patients telemedicine access via phone, email, or video to their employed and affiliated physicians, or to Consult A Doctor’s national network of certified physicians. 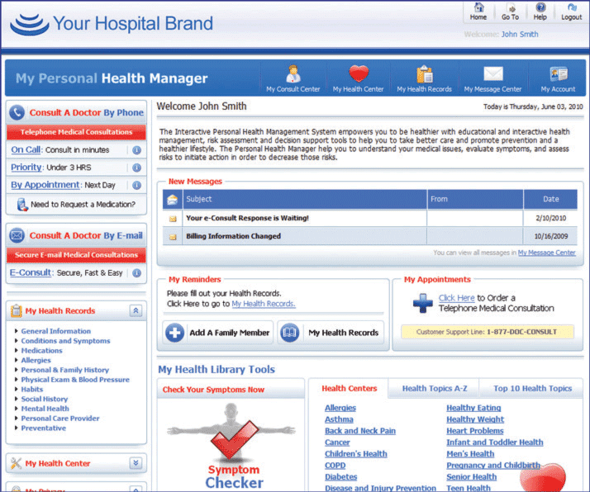 The platform includes an integrated physician and patient dashboard that enables adaptable workflow and business logic. Shareable Ink – helps healthcare organizations transition from paper documentation to electronic records using an enterprise cloud-based platform that incorporates “natural input tools,” including iPads and digital pen and paper technology. Using a specialized ballpoint digital pen, clinicians can continue to fill out forms and other documents manually. The pen records every stroke and transmits the data to Shareable Ink’s data center, where it is processed, converted to digital data and transferred to the healthcare provider’s e-health record system. Built-in analytics give hospitals and physician practices insight into their operations–from a clinical, quality, and efficiency standpoint. Capsule Technology’s Neuron – a medical device integration platform to capture vital signs, Neuron has an intelligent touch screen designed to manage bedside connectivity and workflow for higher and lower acuity, and fixed and mobile environments. Capsule Neuron also has a field upgradeable design for flexibility and scalability. It can be used with RIFD to manage a healthcare enterprise’s future connectivity needs, including smart pump connectivity and encounter reporting. PatientSafe Solutions’ PatientTouch – a mobile care product that enables healthcare providers to coordinate people, processes, and data in real time. PatientTouch delivers Positive Patient Identification (PPID) workflows, clinically contextual communications,and configurable care interventions via a single, easy-to-use device running on the Apple iPod touch. The product is configurable to hospital policies and procedures for medication administration, nursing intervention, clinical documentation, and communication. Summit Express Connect 9 – the latest iteration of Summit Healthcare’s interface engine, an interface consolidation tool for healthcare organizations. The new version emphasizes ease-of-use with a new feature called Summit APEX Mapper, which allows general IT staff to design, filter, and map complex interfaces. Healthcare organizations can leverage EC 9 to support a range of interoperability initiatives, including connecting their hospital information systems to third-party ancillary systems; integrating with physician offices; connecting to health information exchanges and regional health information organizations; and laying the integration foundation required in order to achieve Meaningful Use. Having just written about crowdsourcing for healthcare innovation, I was intrigued by a recent tweet for the TEDMED2012 Conference. Landing on the TED home page, I found myself selecting a link for Lucien Engelen’s presentation, “Crowdsourcing for Your Health”. As the former Dutch Health 2.0 Ambassador, Engelen is also the founder of REshape, a program of Radboud University Nijmegen Medical Centre dedicated to creating the decade of the self-empowered patient. Inspirational stuff, indeed. Originated by Richard Saul Wurman, the first TED Conference was launched in 1984. Building on a fascination with people he met working in the fields of technology, entertainment and design, he seized the opportunity to explore these connections further in conference format. Independently owned and operated, TEDMED remains true to the TED spirit by gathering a community of passionate leaders and doers from a variety of disciplines to “think out loud” about the challenges and opportunities facing health and medicine today. In his thought provoking TEDMED2011 delivery, the tech publisher, Ted Reilly, discusses what healthcare can borrow from Silicon Valley titans, from better product development to crowdsourcing implementation, wearable tech and even advantageous hacking. TEDMED2012 will be convening at the legendary Opera House, located in the John. F. Kennedy Center for the Performing Arts in Washington, DC on April 10-13th. Exciting to note, each of the 11 Main Hall sessions can be live-streamed FREE to qualified healthcare organization auditoriums in HD from professionally produced, multi-camera, high definition feeds. With the opportunity for your institution’s physicians, medical staff leaders, residents, nursing, allied health and administrative staff to send questions electronically to speakers in real-time, what better way to spark innovation in your own organization? Extend the invitation to providers across the street, payers around the corner, specialty organizations over the hill etc. and we may very well have the impetus for collaboration at the local level. 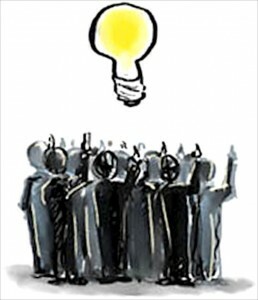 Launched on February 7th, “Your Big Idea: Penn Medicine Innovation Tournament” offers faculty and staff the opportunity to submit patient experience innovations for evaluation and potential funding. A well defined process will help define the top 10 submissions, followed by contestants pitching their ideas to Penn Medicine’s leadership in a town hall setting. The winning ideas will receive funding and resources for implementation. While politics and budget concerns will likely determine the fate of federal care delivery improvements, perhaps crowdsourcing can prove to be the stimulant for healthcare innovation at the grassroots level. In order to improve individual quality of life for chronic illness sufferers while simultaneously reducing healthcare spending, radical re-engineering of the healthcare delivery system must occur. One such innovative design can be found in British Columbia’s Expanded Chronic Care Model. According to this model, healthcare organizations must support chronic disease management (CDM) strategy at all levels. Attempts at improvement must be aimed at global change and include a defined process for addressing quality issues. Furthermore, agreements to facilitate care coordination must extend within/across organizations in the continuum of care and incent providers to improve quality of care. The model further stipulates that health care service delivery should be tailored to assist practitioners in implementing planned interactions to support evidence-based care. Providing culturally sensitive clinical case management services for patients with complex health issues in combination with regular follow-up moves the needle in the right direction. In order to carry out these tasks, healthcare organizations should harness the potential of their clinical information systems through the use of business intelligence software to identify and target sub-populations that would merit additional focus for care planning, targeted messaging and intervention. The patient’s role is also crucial to maintaining good health and this model demands that individuals play a central role in managing his or her health. Self-management support strategies include assessment, goal-setting, action planning, problem-solving, follow-up and establishing contact with community resources that provide support. Mobilization of community resources to support or expand healthcare for chronically ill patients remains additionally critical. The key focus here is to encourage: (a) patient participation in community programs (exercise, seniors and self-help groups) and, (b) partnerships with community organizations to support and develop interventions to bridge gaps in needed services. Current healthcare delivery systems developed around acute visits and crisis management have not been successful in meeting chronic disease care needs. Based on brief and infrequent patient-provider interactions, these models do not provide the sustained support necessary to maintain the healthy lifestyle changes critical to prevention and management of chronic diseases. To better meet the needs of these individuals, care systems must explore new ways to define collaborative care for living well with chronic disease. * Graphic: Wagner, E.H. Chronic Disease Management: What Will It Take to Improve Care for Chronic Illness? Effective Clinical Practice 1998; 1:2-4. Permission to reproduce model image granted from American College of Physicians (ACP), July 7, 2006.